With speed running marathon Awesome Games Done Quick only a few days away, we have ourselves a brand new world record speedrun in Ocarina of Time. Runner Jodenstone started the festivities off right by setting a record time of 18 minutes and 7 seconds on his Twitch stream. And yes, as unbelievable as it sounds, it is possible to finish Ocarina of Time in just over 18 minutes. Jodenstone’s record was set in the Any% category, meaning he finished the game in the fastest possible time without additional completion requirements. Utilizing a series of ultra-precise tricks and glitches, he forcefully broke his way in, out, and through the game. After some excellent optimization and a bit of luck, he, almost in tears, defeated Ganon and set the record. Jodenstone used some common tricks to save as much time as possible, such as running backwards and playing with Chinese text on an iQue (Nintendo’s brand of console in China). But the biggest skip in the run involves something called a wrong warp. With a complex setup involving a bottle and good timing in Gohma‘s boss room, Jodenstone was able to make the game think he was in two places at once. To fix the problem, the game inadvertently warped him into the final areas of Ganon’s Tower. All that was left to do was travel to the bottom of the tower. Instead of slowly escorting Zelda down the entire tower, Jodenstone used a hit by a random falling rock to push himself out of bounds. It is both difficult and lucky to perform this glitch on the first try, so this was the single most important trick in Jodenstone’s run. Finally, to finish Ganon off quickly, Jodenstone performed something called the infinite sword glitch, which makes Link’s weapon (a deku stick) continuously active without the need to swing. Jodenstone’s new time overtook the old record of 18:10, set by speedrunner Cosmo last July. Three seconds may not seem like much, but speedruns, especially in OoT, are extremely optimized. Shaving time off a run is nearly impossible unless a runner does everything perfectly. Most speedrunners only aim to save individual frames let alone whole seconds, so Jodenstone’s record is quite an accomplishment. 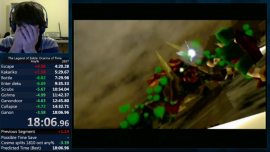 This truly is an exciting start to Awsome Game Done Quick’s week of speedruns.